As mHealth technology matures, concerns surrounding regulation, interoperability, and security will need a resolution. Never underestimate the power of staying connected. The new generation of mobile health (mHealth) technology solutions allows patients and health professionals to communicate with each other in ways never before imagined. By combining the best features of voice and data communications, it’s possible to access clinical and community health data, monitor real-time vital signs, and even perform elements of direct care. Toss in the use of Internet-enabled cell phones by medical professionals in developing countries and you’ve got an mHealth technology industry that’s increasing access to healthcare and health information in myriad ways. According to Hussam Mahgoub, senior vice president of corporate development and research at Diversinet Corp, the 2009 market for mobile medical applications was worth about $41 million, or approximately 1.5% of the total mobile app market. 2010 revenues are estimated to have more than doubled to $84.1 million, according to Kalorama Information. Among consumers, mobile phones have become the primary means of communication. Ninety percent of Americans have a mobile phone, according to the 2010 CTIA Semi-Annual Wireless Industry Survey. Despite those numbers, David Aylward, executive director of the mHealth Alliance, says mHealth technology is still in its infancy. According to Aylward, the developed world operates a centralized system in which consumers travel to facilities. At its most fundamental level, mHealth technology takes medical professionals per se out of the equation—at least to a small degree. Aylward points out that such an alert is not human generated. Rather, it’s a machine reading the results of an insulin test and comparing it with a patient’s health record. Much of the interest in mHealth technology thus far has focused on chronic illnesses (heart disease, diabetes, etc), where patients must be monitored and treated over time, and in the wellness arena, where the focus is on behavior change and modification. As a result, the market has been inundated with apps designed around these functions. Aylward views these apps as superfluous. For example, the U.S. Army is using Diversinet’s MobiSecure Health platform to speed recovery and better monitor the progress of wounded soldiers. Based on the success of a one-year pilot, the Army recently awarded Diversinet a five-year contract to expand the program to serve as many as 10,000 soldiers. The pilot involved members of the military recuperating from mild traumatic brain injuries and other wounds. The system can schedule medical appointments, send reminders, provide health and wellness tips, set recovery goals, and allow soldiers to fill out health questionnaires in real time. Health information such as body weight, mood, energy level, sleep patterns, physical pain, and overall sense of well-being is shared and tracked. According to Mike Kirkwood, CEO of Polka, a company that’s developed a personal health platform, basic applications (eg, medication apps, first aid apps, visualization apps) within the mHealth arena are widely deployed through consumer channels. “Enterprise-sponsored applications are building momentum but are not fully realized yet,” he says. These basic apps are improving healthcare in various ways, including coordinating nursing activities such as shift changes and monitoring, as well as connecting patients and doctors through medication reminders and previsit data sharing. In addition, there are apps that can be used as a reference tool. And that’s just the tip of the iceberg. As the number of medical apps on the market continues to expand, some are questioning whether they need to be monitored more carefully for accuracy and usability. At present, there is a lack of clearly defined standards governing healthcare applications. “The only standards for the exchange of medical information and its privacy are HIPAA regulations,” Mahgoub says. HIPAA, while providing immense benefits to the entire health system, introduces many privacy, security, and overall regulatory implications to the mHealth concept. According to Kirkwood, there are various barriers to information exchange within the confines of mHealth technology. Mahgoub believes there are three barriers to information exchange: a lack of industry standards, interoperability, and security. The lack of standards also leads to issues regarding interoperability between devices, systems, and applications. “A lack of standards between how medical devices communicate with wireless devices creates a fragmented user experience,” Mahgoub says. 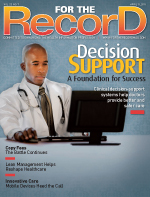 The lack of interoperability between EHR systems also creates issues and leads to inefficiencies and errors, he adds. Finally, the inherent lack of security among many healthcare applications can pose serious problems. The expanded use of smartphones could mean significant gains in the quality of care delivered to poor communities. According to Barry Chaiken, MD, former HIMSS board chairman and chief medical officer at Imprivata, although almost 25% of Americans lack access to broadband Internet services, more than 91% use mobile phones, and 38% have Internet access through their mobile phones. Because smartphones are relatively inexpensive, their impact could be felt worldwide. mHealth technology can also be employed within poorer communities in the United States. “Many people believe we need to focus on areas such as Native American reservations and rural Alabama and other poor areas of the country. Give those people access to their records and provide inexpensive but effective wireless diagnostic devices in the little community clinics. Then they can have access to first-class diagnostic and primary care medicine at a distance,” Aylward says. • The launch of 4G networks will allow for faster, more robust communication via mobile devices. This will also enable more information to be transmitted wirelessly in a faster and more efficient manner, allowing acceptance of more sophisticated mHealth applications. • The cost of mobile devices and smartphones in particular are trending downward, making them affordable to more people and increasing the possibility of having sophisticated applications available to a larger subset of the population. • In many countries, wireless infrastructure is more affordable than landline and traditional broadband services. Thus, more people rely on mobile devices as their primary source of communication. Security, accessibility, and interoperability issues aside, as healthcare costs continue to skyrocket, the economic efficiencies of mHealth technology are causing many to take notice. With healthcare spending approaching 18% of the gross domestic product, Chaiken says we need to be smarter about how care is delivered, focusing on achieving better outcomes with fewer resources.